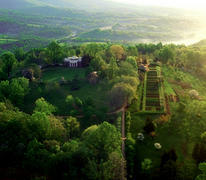 In 1809 Jefferson retired from the presidency of the United States and returned to Monticello. Approximately 200 individuals lived at Monticello and on the surrounding quarter farms of the plantation. The work of rebuilding Monticello was essentially complete. Some of the dependencies and buildings along Mulberry Row that had been needed during the construction were moved or removed, and the vegetable garden below had been enlarged and leveled into a long terrace. The cultivation of wheat and other grains continued to be the plantation's main concern, and a new dam, canal, and mill complex along the Rivanna River were now operating. In his retirement Jefferson turned his attention to some of the things he loved best: his family, his books, and his farm. During most of this time his daughter Martha lived at Monticello with her husband and family, and he was constantly among relatives and an unrelenting stream of visitors. Among the many highlights of this period of Jefferson�s life are his continued political caballing and philosophical discussions with Madison and Monroe during their presidencies; his renewed friendship and unparalleled correspondence with former political foe, John Adams; the building of his retreat home, Poplar Forest; and the establishment of the University of Virginia.